Buying wedding sparklers for your exit is a special way to include your friends and family in your wedding celebration. 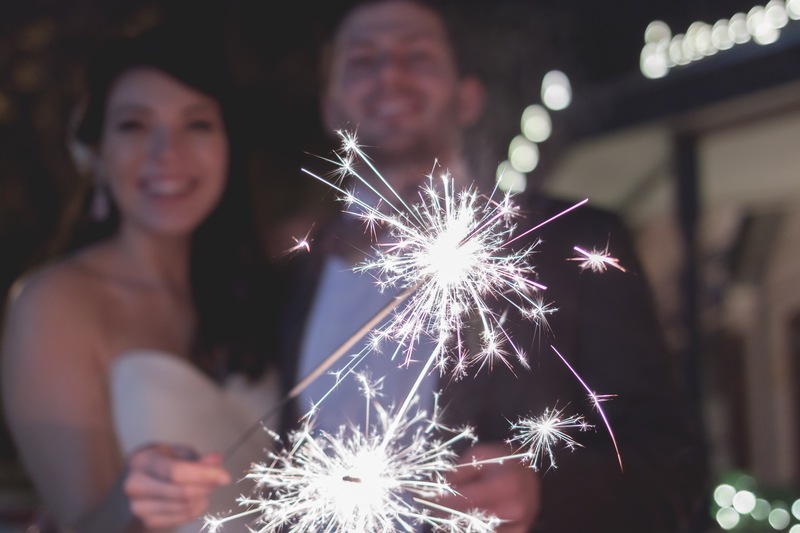 As you exit the wedding with your spouse on your arm, your friends and family will illuminate your path with dozens or even hundreds of wedding sparklers. It a sight to behold, and a memory you will have for a lifetime. Depending on the size of your wedding party, you can choose among our 10 inch, 20 inch, or 36 inch sparklers for sale. Larger wedding sparklers typically require the 20 inch or 36 inch sparklers so you have sufficient time to make it through your entire wedding party. Creating wedding sparklers photographs are an amazing experience and one your guests will always remember. Guests can get as creative as they wish, which makes for some really interesting photos for your wedding album. Guests can create messages or invent magical shapes out of thin air. One great tip for producing great wedding sparkler photos is to be mindful of your location. Try to choose a location for guests to take photos with little ambient light interference, so their photos will come out crisp and beautiful. Contact us today at Wedding Sparklers Outlet for more information on our assortment of wedding sparklers for sale and information on display options like our Sparkler Display Buckets to store your wedding sparklers or for decorative use.